A debt bubble that inflated rapidly across numerous emerging markets in recent years is starting to deflate, and could have a major negative impact on several of the world's fastest developing economies. That's according to research house Oxford Economics. "Most emerging markets have had credit booms in the last five years, and history suggests that up to two-thirds of such booms end in growth slowdowns or financial crises," lead economist Adam Slater wrote. The deflating debt bubble could shave as much as one percentage point annually from emerging market growth in coming years. A debt bubble that inflated rapidly across numerous emerging markets in recent years is starting to deflate, and could have a major negative impact on several of the world's fastest developing economies, according to a note released this week by research house Oxford Economics. 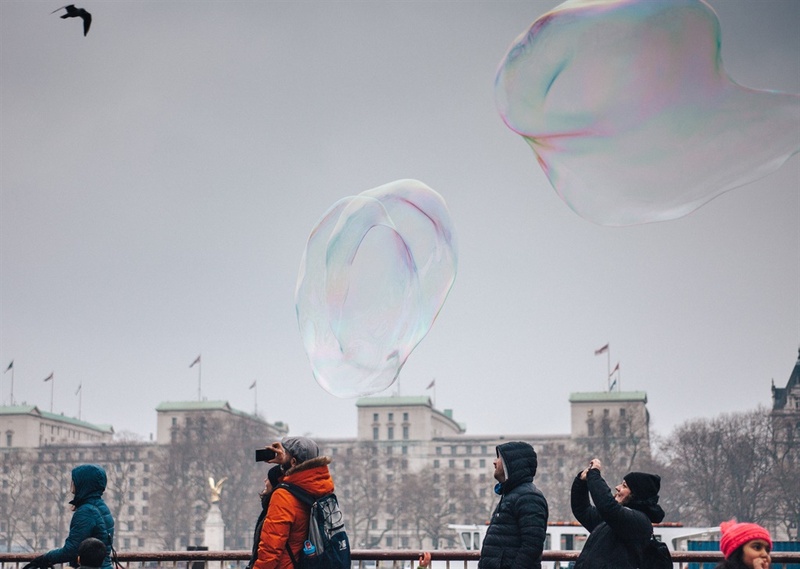 In a note to clients titled 'The EM debt bubble may already have burst' - Oxford's lead economist Adam Slater argued that data from several emerging markets is starting to suggest a coming slowdown. "Most emerging markets have had credit booms in the last five years, and history suggests that up to two-thirds of such booms end in growth slowdowns or financial crises," Slater wrote. "Private credit booms have a high probability of ending badly," he said, noting a study of 175 such booms that found that almost 70% of them ended with either a period of significant growth underperformance or a financial crisis. Such slowdowns, Slater told clients, are "already visible for several emerging markets," adding that "the financial shocks that have hit EM over the last year risk spreading this problem more widely." As a whole, Slater argued, the deflating debt bubble could shave as much as one percentage point from emerging market growth in coming years. Problems with the amount of debt in emerging markets are also being exacerbated by external impacts, Slater's note argued, with wider issues such as the US-China trade war, and a broad slowdown in global developed market economic growth helping to stunt emerging markets. One possible outcome, Slater noted, is that the stock of so-called non-performing loans - effectively loans on which payments are at least 90 days overdue - will likely shoot up. They've already risen significantly since 2015, from less than 4% of the total to around 5%, he said, "in sharp contrast to advanced economies, where NPLs have declined." This problem will likely be most acute in countries such as Turkey, Argentina, and Pakistan, where interest rates have risen sharply in recent years. China, which despite being the world's second largest economy is still considered an emerging by many, is of particular concern, given its huge size. "The elephant in the room is China, which represents almost 50% of the GDP in our sample. 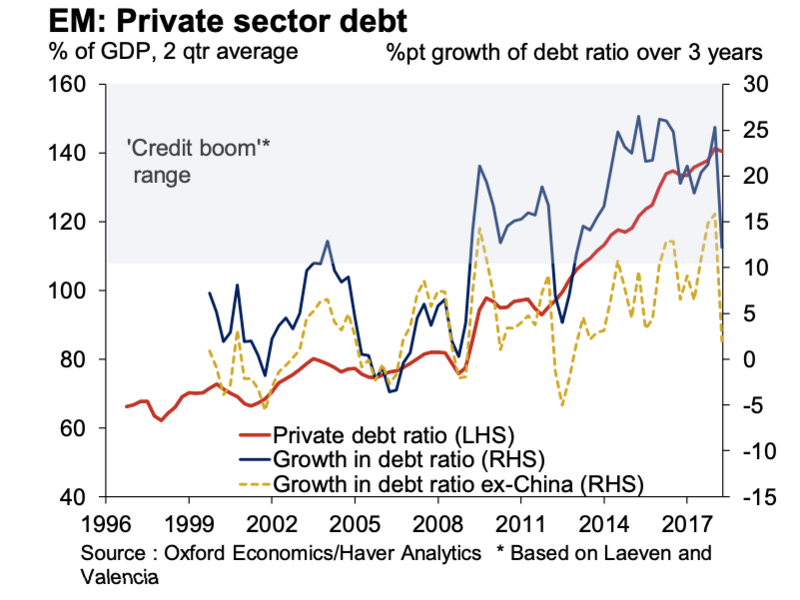 How China's debt boom plays out is key to the overall story of how the EM credit boom of the last decade resolves itself," Slater wrote. "There are risk areas in China - household debt levels are looking elevated by EM standards and shadow bank lending is a possible problem area," he added. Warnings around Chinese debt have been frequent in the past year or so, with a particularly troubling warning coming from S&P Global Ratings late in 2018, which warned that it may be sitting on a hidden debt pile of as much as 40 trillion yuan (R80.8 trillion), concealed off-balance-sheet by the country's local governments. "That's a debt iceberg with titanic credit risks," S&P's report said, adding that including hidden debts, the "ratio of government debt to GDP could have reached 60% in 2017, an alarming level." Slater, however, is fairly sanguine on the risks, saying: "China's specific economic and financial system reduces the risk of a crisis or sharp growth slowdown. A controlled deceleration in growth is most likely."